The term “working forests” refers to forestland carefully managed to supply a steady, renewable supply of wood for lumber, energy, paper and packaging, and more than 5,000 items that consumers use every day. 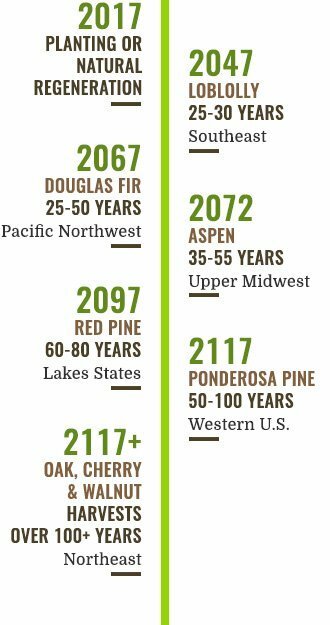 Approximately 360 million acres – or 70% – of the working forests in the U.S. are on private land, owned by individuals, families, small and large businesses, and an increasing number of Americans who invest in working forests for retirement. 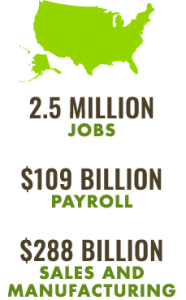 Read more about the economic impacts of working forests in your state. Read the report: The Economic Impact of Privately-Owned Forests in the United States, conducted by Forest2Market. What many don’t realize is that the benefits of actively managed forests are critical for urban communities as well. Working forests filter almost 30% of our drinking water, provide habitat for 60% of our at-risk species, and sequester enough carbon to offset 10-15% of our industrial carbon emissions annually. Wood is a renewable and sustainable material that stores carbon – as living, growing trees in the forest, but also as lumber in our homes and buildings, wood in our kitchen table, and the more than 5,000 paper and packaging products we use every day. In fact, engineers are even beginning to use timber as a renewable resource for tall buildings. By providing a continuing cycle of planting, growing, and harvesting, active forest management actually maximizes forests’ ability to clean our air, clean our water, and provide a mosaic of landscapes for wildlife. When forest owners are confident that they will have a market for their wood when it matures, they are more likely to invest in forest health treatments that prevent disease and infestation, in regular maintenance that reduces the risk of natural disturbance like wildfire, and in replanting to grow more trees. Research shows that demand for wood products keeps markets strong, which protects working forests from conversion to other land uses, like development. Keeping forests intact means keeping forests’ economic and environmental benefits intact too. The reality is that it’s simply not happening in the United States. According to the USDA, from 1953 to 2011, in a time of expanding population and increasing demand for homes, paper products, and energy, the total volume of trees grown in the U.S. increased by 50%. Today, private forest owners are growing 40% more wood than they remove.